The University of Brighton has been awarded £221,000 to develop a sensor device that will measure biomarkers in tissue to aid personalised cancer therapy. Currently, little is known about how different amounts and types of reactive oxygen and nitrogen species influence the state of tumours and their response to chemotherapy. Researchers will be looking to develop a novel electroanalytical sensor that can monitor these species over long time frames and provide answers to these questions. 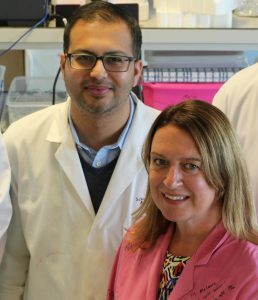 The research is being jointly funded by Cancer Research UK and the Engineering and Physical Sciences Research Council and is being led by Dr Bhavik Patel, Reader in Clinical and Bioanalytical Chemistry, and Dr Melanie Flint, Reader in Cancer Biology, both in the University’s School of Pharmacy and Biomolecular Sciences.